The Receive Gifts button does exactly what its called and it makes returning gifts a lot easier. 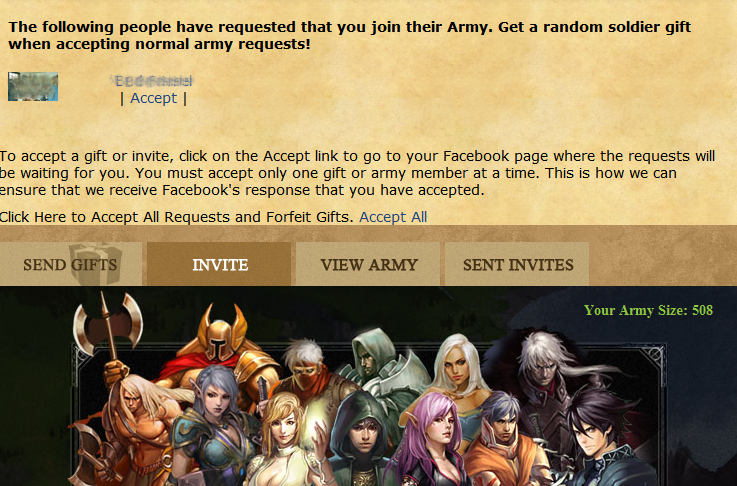 Lost gifts that appear only in Castle Age and not on the Facebook request page can be accepted easily too. Just click the Receive gifts button from the CAGE menu and it will receive all gifts. It uses the same procedure as Castle Age does, but it fills an extra filter for sending gifts to your friends. When sending the gifts to your friends you will notice the new "Return the Favour" filter. These are all the friends from whom you received a gift. When Sending them a gift they get cleared from the list. 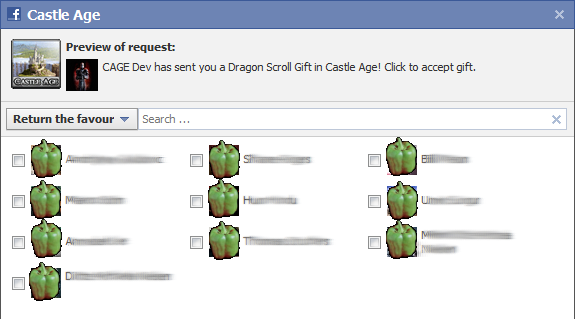 Sometimes you have gifts that only appear in Castle Age but not in Facebook. If this happens go to the Castle Age Invite page where pending gifts are shown. Normally you can delete and accept gift, but CAGE replaces them with just an accept link. Just click it and wait a moment for the page to reload. You should use this always after using any other method to receive your gifts (Castle Age or CAGE). In the settings you can enter the name of one of your Facebook friend lists. This friend list will be shown as an extra filter when sending gifts.